Research in Language (RiL) is an international journal committed to publishing excellent studies in the area of linguistics and related disciplines focused on human communication. Language studies, as other scholarly disciplines, undergo two seemingly counteracting processes: the process of diversification of the field into narrow specialized domains and the process of convergence, strengthened by interdisciplinarity. 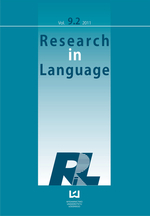 It is the latter perspective that RiL editors invite for the journal, whose aim is to present language in its entirety, meshing traditional modular compartments, such as phonetics, phonology, morphology, syntax, semantics, and pragmatics, and offer a multidimensional perspective which exposes varied but relevant aspects of language, e.g. the cognitive, the psychological, the institutional aspect, as well as the social shaping of linguistic convention and creativity. Affiliated at the crosswords between Eastern and Western Europe and between the Slavic and the Anglo-American tradition, RiL is uniquely suited not only to represent current linguistics research, but also provoke confrontation and provide a forum for discussion for researchers rooted in different schools, distant both in theory and geographical space, from Europe and beyond. Research in Language (RiL) publikuje artykuły przedstawiające rezultaty nowych badań językoznawczych, zorientowany jest przede wszystkim na teksty prezentujące rezultaty badań empirycznych, które mają istotne znaczenie dla lingwistyki stosowanej bądź teoretycznej. Poprzez koncentrację na naturze języka naturalnego i zjawiskach komunikacji RiL stanowi forum wymiany myśli dla językoznawców oraz osób pracujących w dyscyplinach pokrewnych, takich jak socjolingwistyka, psycholingwistyka, kognitywistyka, etc. Copyright: Authors are responsible for observing the laws of copyright when quoting or reproducing material. Submissions should be made electronically as e-mail attachments at the following address: ril@uni.lodz.pl. All submissions should be made electronically (in Word for Windows .doc files or compatible). Document setup: The main body of the text is 118 mm x 170mm which does not include running headers and footnotes (the full physical page size including all margins will be 148mm x 210mm). Ensure that each chapter of your text, as well as frontmatter (dedication, title, preface, forward, introduction or introductory note, contents ) and endmatter (appendixes, endnotes, bibliographies, index) begins on a new page. Use Times New Roman: 10 pts fonts for the main text and all additional parts except endnotes and index (where you should use 9pts), and chapter headings (where you should use 16pts). All text should be single-spaced. Leave an empty line (font size: 10pt) and follow it by the entire title formatted in the same way (with no full stop at the end). Add three empty lines (font size: 10pt) before the first line of text. Remember that each chapter begins on a new page. Subheadings within chapters: For A-level subheadings, use 12pts, in bold. Leave two empty lines before, and one empty line after the subheading. For B-level subheadings, use 11pts in bold (same as remainder of the text). Again, leave two empty lines before and one empty line after the subheading. Make sure all empty lines are 10pt. Number your pages with font size 9pts. For even pages place the number flush left, while for odd number pages, flush right. All material before the introduction should be numbered using Roman numerals, all material after, using Arabic numerals. Place a running header in the centre of every page except the first (title) page of each chapter, appendix, or preface, acknowledgement, foreword, table of contents, illustrations, notes, index, etc. Even numbered pages should read ‘Chapter (Number spelled out)’ and odd numbered pages the title of the chapter. If the title is too long, use an abbreviated version (there are no hard and fast rules – use your judgement for how best to abbreviate it). Use 9pts for all headers, and capitalise. Allerton, D. J. 1982. Valency and the English Verb. New York: Academic Press. Hale, K. and S. J. Keyser (eds). 1993. The View from Building 20: Essays in Linguistics in Honour of Sylvain Bromberger. Cambridge, Mass. : MIT Press. Joyce, P. W. 1979. English as We Speak it in Ireland. Dublin: Wolfhound Press. [Originally published in 1910 by Gill & Son, Ltd, Dublin]. Kemmer, S. and A. Verhagen. 1994. The grammar of causatives and the conceptual structure of events. Cognitive Linguistics 5: 115–156. Chomsky, N. 1993. A minimalist program for linguistic theory. In K. Hale and S. J. Keyser (eds) The View from Building 20: Essays in Linguistics in Honour of Sylvain Bromberger. Cambridge, Mass. : MIT Press: 1–39.